This Saturday, February 2, brings us the opening reception and awards celebration for the 2019 Mid-Winter Hues show at the North Hills Art Center from 7 to 9 pm. The show runs through March 1 and, after the opening night, can be viewed on weekdays (M-F) from 10 am to 3 pm, plus Monday evenings from 7 to 9 pm. The juror for this show was Katie Koenig, a local artist (and very new mom!) whose realistic acrylic paintings of everyday objects I just love! So I’m particularly interested to hear what she’ll have to say at the opening / awards event about various pieces in the show. Apparently there are a total of 106 entries (wow! ), and I’m delighted to report that the two pieces shown in this post, both of which I made late last winter, will be among them! 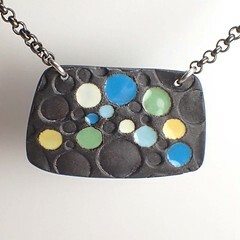 Spring Thoughts on a Gray Day is an enamel-on-steel pendant. Mid-winter days here in this “rust-belt steel-town” are often rather gray…. We remember that brightly colored skies, hillsides, gardens, and more will return. Cars will have snow and salt washed off them, and those with bright colors will reappear. People will take off their heavy, dark coats and again sport bright colors. But in the cold, dark, gray of mid-winter, pastel tones may be the brightest colors imaginable on some days…. But then there are days when the sun does come out and various bits of sparkle do brighten things up for a while. 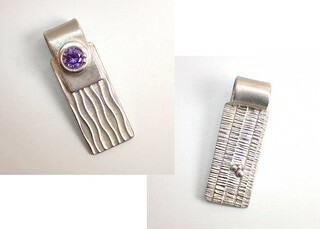 I tried to capture that idea via the lavender cubic zirconia and selective polishing in the reversible sterling (.960) silver pendant I’ve titled Serendipity Wave, while the textures on each side of this piece remind me of various kinds of tracks in the snow … or perhaps dreams of tracks in the sand dunes of an escape to warmer climates! I’ve seen some preview pictures of a couple walls of paintings (probably about a third of the total Mid-Winter Hues show) and the thing that impressed me was how many seemed to be attempting to banish the grays of winter with bright colors! So I’m looking forward to seeing the whole collection on Saturday. And to seeing some friendly faces at the opening. Oh, and after having spent that afternoon in my studio, to suddenly trying to fit in a little stop at the Mt. Nebo Pat Catan’s (did you see my last post?!) on my way there. Happy New Year! OK, I am a few days late with that thought, but where has the time gone? How can it have been just over ten years already since I started this blog?! I want to thank everyone who has helped to make the past ten years so wonderful! After a break for the Holidays, my (mostly) Second (mostly) Saturday Studio Sessions return on January 12! This month the time will be from about 2 to 6 pm. I’m setting it a little later than usual so it will run into the International Pot Luck Dinner that Global Pittsburgh is hosting in the same building from 6 to 9 pm, to make it easy for folks who want to attend both. I’ll have a little mini-shop open. Mostly it’ll have my newer enameled pieces on copper or steel, along with a selection of silver earrings and a few of the smaller silver pendants. (If you missed getting something special that you wanted last year, let me know ahead of time and I can try to bring that in too!). If I make any adjustments to the dates or times for February or March, I will post updated information for those events over here. My first workshop for the year will be on Friday, January 18. I’m currently recruiting students for two workshops in my studio. 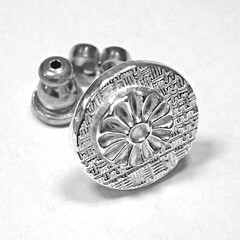 February (date & time TBA): Learn to Make Buttons! March (dates & times TBA) A Two-Day Introduction to Bronze. If you’re interested in being kept in the loop for one or both of those, let me know! Send me an email, or leave a comment with this post, and you’ll be included in the discussion of when we’ll meet and some specifics on the possible projects. … because we get rainbows when light breaks through the haze and clouds in just the right way! 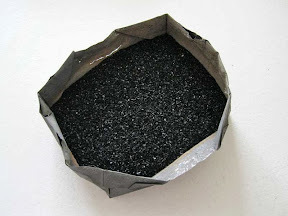 So I’m trying to bring that on by making rainbows, adding vitreous (porcelain) enamel to hand-made steel pieces. 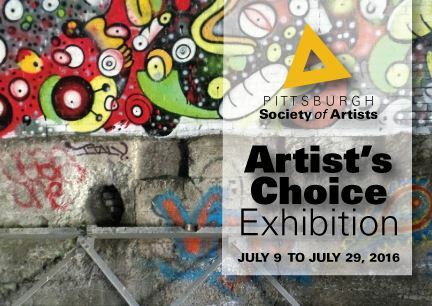 And I’m delighted that the juror for the Pittsburgh Society of Artists selected this one (whose little photo I’ve added to their postcard) for their 53rd Annual Exhibition! The thing is, I really thought I’d taken a “final” photo of this piece, after a couple more firings of red and orange. Those are among the most sensitive (i.e., most easily “burnt”!) colors, so I’m super-careful with them. But I can’t find any later ones (after I’d added some jump rings for hanging it, and strung it on a nice black snake chain). I just had to crop the little image out of a big “what I did today” shot that I took before I left my studio that night. That collection had a number of rows, with several pieces in each row. Ones at the top were finished; lower rows needed increasingly more work. This one was in the middle of the bottom row: not too bad a starting point, if I do say so myself! You can see where I was going with it. 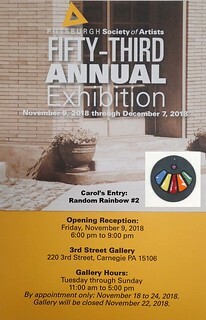 Anyone in SW PA who wants to see it in person is welcome to stop by the 3rd Street Gallery in Carnegie, PA. It’s a delightful little gallery (and frameshop) that I am happy to have discovered through the process of getting juried-into this great show. I’m heading over to the show opening this evening, wearing another of my rainbow-pieces. I’ll have a few for sale in my Open House tomorrow; there are several in the works on my bench; and I’m hoping to find time to make more before the holdiay-sales-crunch, which has already begun, gets fully underway! They’ve already helped me feel better and I’m hoping they’ll do that for others too! 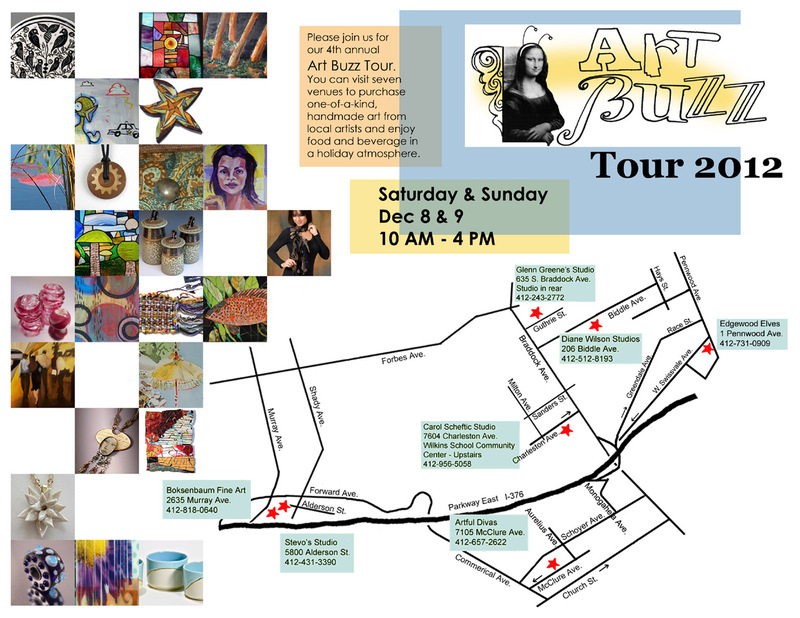 “Cool Sizzle” at Art All Night … Tonight! Yes, the last weekend in April once again brings us Art All Night! And Cool Sizzle will be spending all night night there tonight! Living in Steeltown (aka Pittsburgh, PA) it seemed only right that my tenth-ever entry into this annual show should, at last, be made from steel! All my earlier ones used silver, bronze, and/or copper, so steels’s the one metal from my main repertiore that hasn’t yet been shown there. black: not a shiny, stainless steel. Sometimes I carefully design a piece (i.e., with a theme and a title from the start) but, more often, I start with a vague idea and see where the piece takes me. This was definitely one of the latter. Late last year (actually, while doing some Christmas shopping) I noticed a silicon trivet / potholder with a cute “flat bubble” design on it that I thought would make a nice “texture stamp” for a jewelry piece, so I bought it as a little gift to myself, and set it aside. Just this past Monday, anticipating Art All Night, I was looking around my studio and debating whether to enter something I already had on hand or try to complete something totally new. I moved the tray of enamel powders that just happened to be sitting on top of that trivet, and I knew: try to make something with it, out of steel, and colored with enamels! Why call it Cool Sizzle? adding color by wet-packing vitreous enamel powders into some of the hollows in the design, which ended up taking five more firings (though only at about 1500°F this time). how the metal normally feels relatively cool to the touch. 2018 represents the 21st annual Art All Night event, and the first one not held in the Lawrenceville neighborhood! I wasn’t even living in Pittsburgh when I first discovered it: I was still living in California then, and just happened to be in town for a conference, noticed a little blurb about it in the local arts & entertainment newspaper, and decided to go check it out. And was blown away by this wonderful (then, little) exhibit of community art! It had everything from little-kid “refrigerator” art (with some great bidding wars among grandparents, aunts, uncles, cousins, etc.! ), to people who made something (NFS: Not For Sale) for themselves that they’d just like to let others see, to wild constructions you’d never, ever see in a regular gallery anywhere, to works that were clearly professional creations, and more. A year (or was it two?) later, I was invited to come back to the area for a job interview around the same time of year. So I checked to see when Art All Night would be, and asked to schedule the trip for dates that could include it. I didn’t get that job but, surprise, a couple years later was invited to interview for a different position. And I scheduled it the same way again! That one ended up involving a lot of negotiating and re-designing and more negotiating before it got sorted out so it wasn’t until a whole year later when a house-hunting trip just happened to coincide again. Oh, and in between there somewhere were a couple little springtime vacation trips to visit with some friends that I also planned for late April. And I’ve continued to go, to volunteer, to offer demos, to enter pieces — one or more of those each year — since actually moving here. And if/when I ever move away, I sure hope I will want and be able to return for future Art All Night events! But the thing about it is how much it has grown over the years! It started rather small, but grew quickly. The growth has slowed a bit in recent years, but it is still so very big that finding a suitable venue is now a challenge. Community Development Corporations use it as a way to draw first hundreds, then thousands, and now tens of thousands of people to some huge yet empty building. In addition to the pieces hung on walls, displayed on tables, or built up on-site on the floor, there’s live music, art demonstrations, participatory activities, food & drink, and more. And it really does stay open all night: current hours are from 4 pm on Saturday through 2 pm on Sunday! Adding up the different times I’ve gone to it across all the years, I’ve been there at just about every time of day or night, and the vibe does vary over the duration. Do let me know when you’d like to go! I was trying to think about what photo to post today in honor of “Pi Day” 2018 and this one came to mind. It shows something vaguely along the lines of circles and radii, so that does fit. The real reason I chose it is because it shows similar circles with two different areas, and Pi is all about the ratio between a circle’s radius and its area. I created these two pieces a little over four years ago, shortly after Hadar came out with her “friendly,” “one fire” clays. And I wrote about how, even though they’d started out the same size, they ended up being so different. You can check my post from early February of 2014 if you missed it then (or forgot!) and are curious now. Or you can just use this as an inspiration for making something yourself, whether that is jewelry, or pies, or something else. If you do, please leave a comment about your creation! Cranberry Artists Network Double Feature! I wrote about Kepler’s Dream on Thursday. On Friday, I learned that Spring Thoughts on a Gray Day had been accepted into a second Cranberry Artists Network event, their 2018 Spring Show this year with the theme of Drip, Drizzle & Splash (DDS). Now, to be honest, I’d wanted to submit both these pieces for consideration for DDS. Except I was in California for the second half of February. How is that relevant? The invitation to submit one piece for the International Womens Show arrived while I was in the air on my way there: ’twas the first message I saw when I turned off “airplane mode” on my phone upon landing. And that is when I saw that the deadline for submission would be the day before I’d return. So, um, I was going to have to submit for that something I’d have ready before heading home! So, as I described in my March 8 post, I decided to enter Kepler’s Dream for that show. The prospectus for Drip, Drizzle & Splash, which allowed us to submit two pieces for consideration, had encouraged us to consider “the emergence of new beginnings and the way our weather and environment makes this happen.” While I didn’t have another piece ready that complemented Spring Thoughts, I did have a shamrock piece from my Urban Flowers series that I’d just made in December that seemed to fit the theme. So that was my second entry. And I was delighted to learn that my Metropolitan Shamrock has also been accepted! That show will be hung on the night of March 12 and officially open on March 13. Both shows will be on display through April 5, 2018. There will be a public reception for both of them from 6 to 8 pm on the evening of March 22. If you’re in the area, I’d love to see you there! I call this piece Kepler’s Dream, and it’s the one I chose to enter when I was invited to participate in the Cranberry Artists Network‘s show in honor of International Women’s Day. Now, IWD is March 8, and the show is only being “hung” that evening. The official dates of the show are March 9 through April 5. It looks like there could be as many as 33 pieces in the show. There will be a Public Reception from 6 to 8 pm on Thursday, March 22. Question: Why enter a piece named after Johannes Kepler for Women’s Day? Discussion: Well, I was in high school when I first learned of his discovery that planets moved in elliptical orbits around the sun (not the earth!) and the sun itself was not even at the center but at one of the two focal points of that ellipse. That was also when I first heard about his conjecture from the early 17th century on the efficiency of packing spheres. That was not really proven until early in the 21st! I actually worked for a few years late in the 20th century with some folks who were involved in trying to find the proof! Anyway, the readings I had been inspired to devour back in high school were key to opening my mind to being able to “think big” about the seemingly-mundane topics we were covering in school. Did you know, for example, that Kepler also published the first description of the hexagonal symmetry of snowflakes?! And he looked at the efficiency of hexagonal packing: think beehives! There’s more: go do some explorations of him yourself! And so after decades of doing formal mathematics using accurate visual representations of what IS, here I am now doing artistic explorations of what COULD BE. I had no thought of Kepler as I began this piece: it would look rather different if I had! (And such a piece in this line will likely come to exist eventually.) But as I finished it, and looked at the combination of shapes I’d created (sort of oval and round), and thought about the colors I’d chosen (with their references to the skies above), and talked about it with some friends I was visiting at the time, I just began to wonder if Kepler might ever have dreamt anything like this. Answer: So I named it Kepler’s Dream to honor him for being one of the influences (indirectly and centuries later) on this woman’s life! 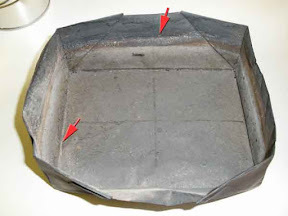 After firing so it would sinter, the steel was treated to help it resist rust. Then I applied three different enamel colors into the openings of the embellishments. (Yeah, the mathematician / geometer in me had fun figuring out how to space out three colors among ten spaces, when ten is not an even multiple of three.) Because of the way I applied the enamels, it was easy enough to fire several different colors at the same time; to get good coverage, on the other hand, it took multiple applications of the enamel powders, and re-firing each round, until it came to look like this. As a final step, I applied a light coat of wax which helped to even out the color of the steel and should also help to further protect its finish. I made several others at the same time which I’ll try to remember to discuss in a later post. But I am including a tag with each one warning a buyer that, because steel can rust, I recommend some common-sense precautions: don’t wear it while bathing, showering, or swimming and, if it does get wet, try to dry it thoroughly as soon as possible. Finally, a big “thanks!” to Hadar Jacobson for the recent workshop and especially for the photo, so I’d have it in time for the show! 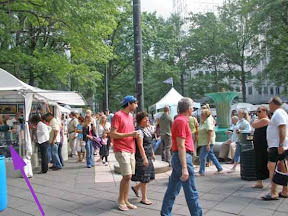 Picnics, and Parties, and Art Shows, oh my! What’s this mythical concept of “lazy days” of summer? Summers just seem so busy, with all sorts of events and happenings and things to do that one really does not want to miss. That’s not a complaint: it’s just a puzzle to me, where the lazy-days idea came from! Anyway, amidst all the many things to do all summer, this is a super-busy weekend. Since I post here mostly about art & jewelry / teaching & learning types of activities, I’m going to skip over the truly “personal” events this weekend. 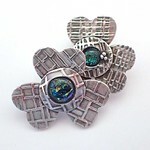 I can fill a long post with places my jewelry and other art-creations are going themselves this weekend. I also had a dozen pottery items accepted for this event! I don’t often post about my clay-clay work here, but you can get a glimpse of the twelve I sent to Sweetwater below. Note: you really should click on this photo! I hope everyone who does will let me know (e.g., via a comment, either on this blog or at the photo-sharing site the click will take you to) whether you were surprised at what you found there, or whether, especially if you feel you know me and my interests, it was what you imagined as soon as you saw this photo. Here’s wishing everyone a pleasant summer weekend, full of kindness and friendship. And Happy 200th Birthday to Pittsburgh, PA, today too! For other venues, please see the list of Ongoing locations down the right side of this blog. If you find yourself missing any of those, no problem. Just get in touch with me: leave a comment on this post, or message me via Convergent Series page on Facebook (and, while you’re at it, a Like there would be very much appreciated…). We’ll find a way for you to explore my creations! I’m not sure how much else I’ll manage to post this month. But I have new designs in the works, new workshop pieces I’m testing out plus, of course, new variations of ongoing favorites in both those categories … and lots more for 2015! I look forward to posting about all of those in the New Year, and I hope you’ll enjoy reading about them too. This time, it’s more Intermingling than Interlude! In just one week, I plan to go all out on a combination of two of my major interests: metals and gardens. “In 2014 the Penn State Master Gardener Program of Allegheny County partnered with the Rivers of Steel Heritage Corporation to develop a comprehensive plant survey of the lands in and around the Carrie Furnaces in Rankin, PA. Eight Master Gardeners set out to learn more about the succession of native, aggressive and/or invasive plant species that are surviving, and even thriving, in these disturbed soils. “As part of this research, the group was charged with developing an interpretive component to educate the public on best practices in environmental stewardship. 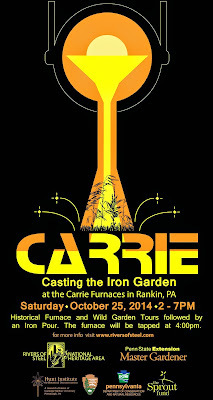 For previous projects, this interpretation often materialized in the form of a booklet, poster or on-line resource, but given the nature of the Carrie Furnaces (pun intended) and its history and connection to iron, a multidisciplinary team in science, art, history and industry was created to develop a unique approach. “Their decision was to create ten interpretive plaques, cast at a live iron pour event and designed to lead participants through the fields and structures of the site, providing a narrative of the wild gardens taking over the former industrial landscape of the Carrie Furnaces. Designed to allow the visitor to take rubbings, these plaques will include botanical illustrations of the local plant community. The illustrations, provided by the Hunt Institute for Botanical Documentation, will highlight features such as bark, fruit and leaf form for easy identification. The images are paired with narratives written by Penn State Master Gardeners on plant succession inclusive of soil conditions, environmental factors and the potential for future plant communities. Do let me know if I should be on the look-out for you that afternoon! It’d be great to see some familiar faces: garden-friends, metal-friends, and more! Flexible Greenware, or What Metal Clayers Mean by Flexible Clay…. There’s a lot of “buzz” today in the Metal Clay community: Mitsubishi has just released a new fine silver product they’re calling PMC Flex. Well, it’s been available in Japan for a couple months now; the rest of the world is able to order it starting today with, I’ve heard, shipping to commence on Monday. I was lucky enough to get my hands on some of it just this week, so I haven’t had the months of experience with it that some of the official “early testers” have had, but I wanted to report my very first reaction…. First, though, some background. I’ve been working with clays that remain flexible after drying almost as long as I’ve been working with metal clay. I will say, that I find the term “flexible clay” to be a bit confusing: all clay is flexible when you’re working with it! The ones I’m going to talk about today are the ones that remain flexible, that do not get really hard, until they are fired in some way. 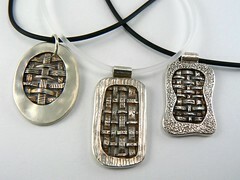 The center pendant in this group of three (photo, left) was one of the first pieces I ever made this way. It was after I’d used some clay at an event where I gave repeated demos, working and reworking it, exposing it to oil (so it wouldn’t stick to the textures I was using with it), adding water (to replace what had evaporated during use, but also risking the washing away of some product, silver and/or binder). By the end of the day, the clay had gone rather funny: it wasn’t acting like clay at all. It had gone from sticky to slippery. It didn’t leave bits stuck on tools or hands but it did sort of slime everything it touched. Was it destroyed? I had no clue. In the very first class I took, I’d been taught that you could extend the working time of clay by adding a very tiny bit of glycerin, but one should take care to not add too much. (And … I later heard that same instructor say she no longer recommended doing that.) I’d read in some online group that you could “revive” clay that had gone “off” by adding a bit of glycerin to it. I’d also heard or read somewhere (in a class? online? this was years ago now..) that you could make clay that would remain flexible after being allowed to dry if you added a good bit of glycerin. No specifics. Nothing about how much, or how one should do it, or just what would happen if you added too much (other than, obviously, thinning the silver out so much that it could not sinter in the kiln). There were just vague comments. Questions I’d seen about such details had remained unanswered. But … I had some glycerin on hand: what more did I have to lose beyond this clay that was unworkable? Why not try it? And, while at it, why not try to go the whole way? I had a little bit left from that test, so I added a little more glycerin, kneaded it in (it was easier this time), waited maybe an hour or two, then I rolled out a couple more small bits and left those to dry overnight. Voila! The dried clay was enough-more flexible that I could weave the strips much closer together: the pendant to the right in the collection was the result of that. But this getting-more-flexible trend was appealing. I had just a tiny bit left, so I added one more drop of glycerin to that. (Proportionally, with how little I had left, that was a huge amount more!) Again, I kneaded that in and wrapped it up. The next day, I found it that my final scrap was flexible enough that I could tie it into this little knot. I used the entire last bit in making this, spending time adjusting the knot to the middle so the ends would line up, meaning I didn’t have to trim any off. I used fresh wet clay to add the little coil along the top. Once that had dried (hard), I made a loop from fine silver wire and embedded that into the top. I apologize for the quality of that image: it’s a detail from a very old photo, but it’s all I have to show of that piece now. 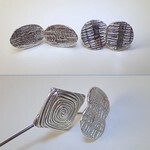 Over the next few years, I continued to make my own silver clay that would remain flexible as greenware, playing with weaves, knots, twists, and other shapes in various ways. The curved-square piece to the left (which I’ve called Magic Carpet in public but is, to the mathematician that’s still quietly in me, a basic example of creating a bit of hyperbolic space…) is but one of such explorations. 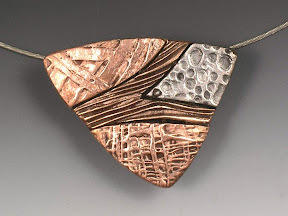 I learned about Hadar Jacobson and that, in her first book, The Metal Clay Handbook: Textures and Forms, she talked about this, which is one of the main reasons I bought that book … which, eventually, led me to learning much, much more from her and her approaches! When Hadar came out with her clays, I played around with them for a bit. But I didn’t go all-in for her clays until two things happened around the same time: Hadar herself came to town (well, our local metal clay guild chapter brought her in!) to teach a workhop on her “married metals” approach (which I took), and I started playing around with adding glycerin to her original line of clays, which she now calls the “flex” powders, because they are the most (not the only, but the most) conducive to having glycerin added to yield clay that stays flexible if you want that. (If you want the clay to dry hard, just don’t add anything besides water to the powders.) Mixed Metaphors, shown to the right (before it got its bail and went to live with my cousin Debby) is one example using copper, bronze, and a little bit of steel while combining married metals with weaving. At last, on to the new PMC Flex fine silver metal clay. Needless to say, when I first heard about the new PMC Flex, I was both eager to try it it and wondering why one might purchase that rather than just go the DIY route. When I first got my hands on a pack of it, I began by trying the techniques I have in finger-memory, the ones I’ve been doing and teaching for years, just to see how it performs. The very first thing I did was to grab a little piece of it (a bit less than 1 gram), and roll it out into a “snake” or “rod” shape. I left it to dry over night. 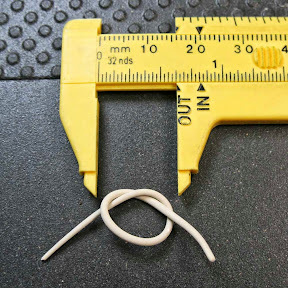 The next morning, I measured it: 3.25 inches long, and the size of 15 gauge wire. (Clearly, it will have shrunk a bit while drying, and will shrink even more when it’s fired. But that’s it’s “dry” measurement.) It seemed like it would bend, but felt a little stiff. I’ve had that experience with the glycerin-enhanced clays too, and found that gently “working” the piece along its length will often make it more pliable: I tried that with this piece, with the same good result. I then tried to tie it into a knot. The photo shows how far I could get it to go before feeling a lot of resistance. (The calipers shifted a bit as I was setting up the photo, so they represent a visual guide and not an exact measurement, but that’s OK for this very-preliminary report…) If I want more elaborate knot designs, I know how to get a tighter bend with my DIY-flex (as shown, for example, even in my first silver knot above, which began with a bit of clay about the same size as this). Still, this PMC Flex will clearly be great for a variety of other applications. I plan to write more about those, with photos, in future posts. As ever, as time allows…. But I’ll close by saying that it is a lot of fun to have such a delightful new toy to play with! Update: With Hadar Jacobson’s Flex-clay powders, one trick to slightly increasing the flexibility of a piece of “dried” clay is to refrigerate it for a little while. I tried that with the above piece and it seemed as though it was going to let me pull it a little bit tighter. That is, until is broke just about in half. I’ll use the two pieces some other way, but figured I should note that (as a reminder to myself, as well as information to you…). I have to admit something: I love “draping” metal clay! The clay is so soft and pliable, and the end results are so satisfying! I am impressed with many of the effects that can be obtained via various “metalsmithing” techniques, but this draping is just sooo different from working with “solid” metal (sheet, wire, etc.). Yes, there are a lot of little “tricks” involved in successfully draping a mix of powdered metal, binders, and water, but it still is a relatively easy process for achieving a look that is much more difficult to achieve via any methods used with, say, sheet metal. All the photos in this particular post were made with Hadar’s new-ish Friendly Bronze metal clay powder. At one point or another, I’ve draped every clay I’ve ever tried: every brand, every metal, etc. (OK, no, I haven’t done this with gold. It should work, but I don’t feel I can afford to use gold for anything this big. 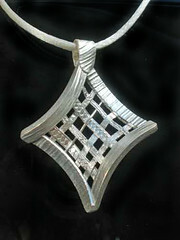 Of course, if you can afford it, I’d be absolutely thrilled to “drape” a gold piece for you on commission!) But all the different brands of silvers, coppers, bronzes, steels: yes! I’ve draped those. Anyway, the two draped oblong shapes are ones that I made in advance of a recent workshop. They were fun to make. I fired them both before the class; they ended up being about 37 mm long (excluding bail) and 25 mm wide. The idea was for me to have finished polishing one completely, and use the other one in my demonstration illustrating some techniques (and potential issues) in polishing such drapings. They also served to illustrate two of the many different bail-mechanisms that can be used for hanging the piece. The long and narrow piece was begun during the in-class demo. It illustrates a different kind of draping, and a different kind of bail structure, both of which are harder to describe (but still easy to show) compared to the first two (oblong) pieces. It’s 66 mm long by 24 mm wide, and contains a little over 24 grams of metal. 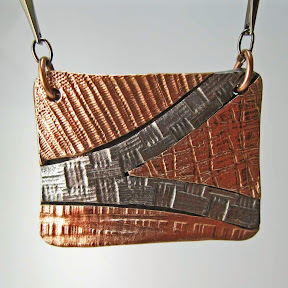 Have you tried draping metal clay yet? If so, please leave a note about it in the comments! Another new clay means another trial making rings! 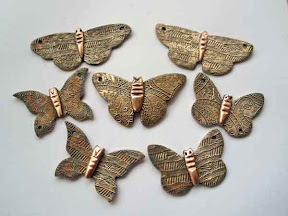 Though I love rings–both wearing them myself and admiring those on others, in shops, at galleries–and I love making small adornments using metal clays, in general rings are not my favorite things to make. I’ll leave the reasons for that for another post specifically about rings. Why? 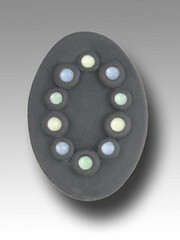 Because today I want to talk about rings made from another “new” clay! Now that I’m familiar with a number of different types of metal clay, one of the things I often do to try to get myself comfortable with a new one is to make myself some rings out of it–to test what it’s like to work with–and then wear them everywhere–to test how they hold up. And my first question about an iron-bronze formula in particular was whether it would hold up as well as I might expect under all the stresses I put on rings. So one of the first things I made when I got my hands on a (pre-release!) tube of Hadar’s new White Satin was to try making a couple of rings. I wasn’t going to be able to make them my favorite way (with iron in it, I was not going to count on being able to fire the shank first and then form it around a mandrel–a method that pretty much guarantees it will come out a perfect fit–and I was too eager to try it to first make a little test strip to see if/how I could manipulate it, though if will try that eventually…). And I didn’t want to make a ring using the “common” metal clay way, shaping a band in the clay-state (with lots of potential shrinkage-issues during firing). 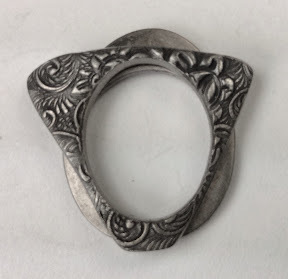 So my first White Satin rings were a pair of seamless stackers with each one textured on one side (using the “eastern paisley” design from Cool Tools) and plain on the other side. My plan was to make them two different shapes, and wear them with the “plain” sides together. And, no, they didn’t warp during firing: I made the openings oval on purpose! I usually make my rings either oval (as shown here) or square-ish (a rounded-corners trapezoid). The latter is easy with metal I can whack around something like the finger-shape mandrel from Rio Grande. Since I wasn’t yet ready to try that with White Satin, I just cut the clay itself with an oval opening. Hadar said rings would shrink about 3 sizes, so I used that for my beginning estimate. Though, since I was making my rings oval, I did cut the opening a tad smaller than that. What I really did was to fit a narrow strip of metal inside a ring sizer at the +3 size, but then trim it a tad smaller. I then shaped that into an oval, and used that to cut my clay. The reason for down-sizing a tad is that, to put on an oval ring, I turn it sideways until it’s passed over my knuckles, but then turn it back up to wear. The “twist” allows the larger-direction opening (still at the +3 size) to fit over the larger-dimension part of my finger. But when it gets twisted back again, the straighter side (now smaller and narrower) holds each ring upright better, so I don’t have to keep straightening them. The rings shown here were fired and then polished. And they did come out fitting the finger for which I was trying to make them! Since they contain iron, which will rust, they were sprayed with an acrylic protectant. Since they are rings, I have no clue how long that protection may or may not last. That’s what I’m now trying to test! I’ve been wearing them off and on for almost two weeks (more on than off, but nowhere near constantly) before taking these snapshots. They seem to be holding up fine in the short term. It’ll just take more time to see how they do over a longer stretch. In the meantime, I am very happy with the results so far, and I hope you appreciate this early-report. I Made It Onto “Hadar’s List”!!! 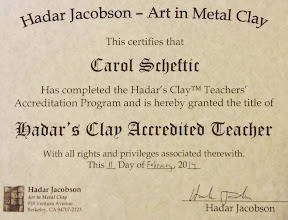 It has been one long, fun, hard, exciting, challenging year, with lots I’ve learned and still more I’ve been inspired to explore further, but I’m now a “graduate” of the Hadar’s Clay™ Teachers’ Accreditation Program. As I write this, there are about two dozen of us around the world. Maybe a dozen or so more should be added in the next month. There’s a second group that should finish before the end of the year. I feel truly honored to have had the opportunity to spend the past year working with such an amazing and wonderful group of artists and explorers. I look forward to the adventures we’ll continue to have together, and to continuing to share them with my students and with all my other readers here. Check for links to my workshops down the right side of this blog. My first four-part series based on this program will run in my studio during April and May of this year. (I’m still teaching silver too, and have four individual classes set up for that in March.) Do let me know if you’re interested in either the silver classes or the base metals series … or both! 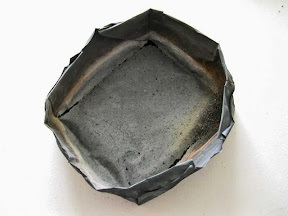 A few days ago, I was talking with another metal clay artist about how I fire bronze, copper,and steel in vessels I “fold” myself from sheets of steel “no-flake” foil, when I realized it had been two years since the last time I’d mentioned them here. Which I find interesting: in three years, I’ve used three boxes! Counting them up, I figure I put a box through a firing somewhere between 1 and 2 times a week, on average. But few things in my life are average…! No, really, it’s more like 6 or 7 times a month, but even that tends to happen in maybe two “bursts” of several firings in quick succession, then it’s several weeks before I do that again. Something I learned from my first no-flake foil box, plus discussions with others after I wrote about that, is that the foil tends to crack open along the top edge of however much carbon is typically used. So, with my second box, I started out by piling the carbon a a little bit higher than I’d been doing. Then, when some cracking started to appear, I could just lower the level a bit, and get a number of additional uses out of it (because the holes–eventually stretching into a longer tear–were then above carbon, it didn’t leak out)! With the extra firings, it also began to crack along the top-most folds: what that meant is that I tried to be a bit more careful as I handled it, especially when moving it in and out of the kiln. Eventually, though, I decided I was carrying conservation perhaps a bit too far: after at least 75 firings over the course of a year, I took its picture and retired it! Box #3 has lasted even longer! It has handled 80-some firings over almost 14 months. I did not keep fully-detailed records but, between the notes I do have and my general memory of the past year, I’d say that for its first year, I did a higher proportion of firings in the mid-fire range, and a smaller share in the high-fire range, than I had done with the first two boxes. That seems to have reduced the number of little holes it developed, so there were fewer to spread into wide-open cracks. That is, until the start of this calendar year. That’s when I started playing with Hadar’s One-Fire High-Fire Trio. The single firing needed to both de-binder the clay and sinter the metals is a real treat, but when I started firing batch after batch in the high range, I noticed that the sides started warping out. So, even though Box #3 does not have any big holes, it is now being retired because I can barely fit it in he kiln any more: it is in danger of hitting the kiln’s thermocouple! But. I still think that these boxes are well-worth their cost! Do you? If you’ve stumbled across this blog / post without a lot of previous metal clay experience, you may want to just click on the photos to enlarge them and read the brief notes there. For the rest of you, I’ll start by asking if you remember the earrings I wrote about last week? 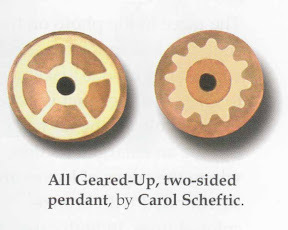 For today’s post, I’ll start by saying a little about the steps I went through in making the bronze-parts of the two-metal earring pair I described earlier. Grab a good-size chunk of Champagne Bronze clay. Roll it out to a thickness of four cards. Position cards around it, two cards high. Use a circle cutter to make two “large” circles. Do all the usual clean-up and drying of the various bits of clay. 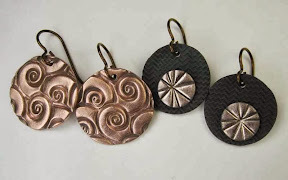 When the circles had dried, I used the small, matching “inner” circles (where each set of lines all intersect) over some Low Shrinkage Steel XT to make the earrings I mentioned before. So far, so good. Looking at the dry “outer” circles (washers, actually: the larger circles with their centers removed), I had another idea. Using a texture sheet with some concentric circles, I rolled out two more sheets of clay, one each from Friendly Copper and Low Shrinkage Steel XT. 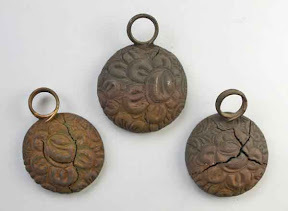 Then I centered one of the bronze “washers” over each of those, and cut a matching circle out of each clay. Finally, I rolled out another pair of those two clays, this time using two different “flowered” textures, and cut out a third circle of the same size from each of those. Both the circles- and the flower-design were rolled to four cards at first and then, with the textures, down to two cards. (I didn’t roll the clay with textures on both sides because: (a) I hadn’t yet decided for sure how I would use them, and (b) I wanted to center the designs on both sides the way I wanted, and doing that separately for each side was easier.) I set all those aside to dry (as well as a few other bits I’ll try to write about another time), figuring I’d use them for something…. A few days later still, I got to wondering about the “high fire” temperature of these new “one fire” clays. In general, even with this new trio, it’s the bronze that’s going to limit how hot the product can get during the sintering process. Would the “bronze embeddable” bails survive that heat? (I use them myself, on occasion, and I often offer them to students, especially in introductory workshops, because they can save a bit of time when compared to having to make one’s own bail.) 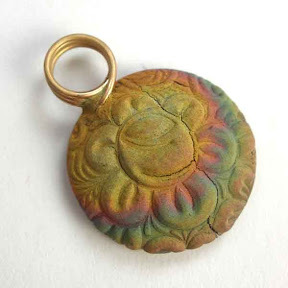 So I took one of the bronze washers, attached the copper disk with circles and let that dry, then positioned the embeddable bail and attached the copper flower-design disk. Once all that had dried, I filled in a few little gaps, dried it all some more, and finally fired the piece. The results were interesting, as shown in the first photo, above. It all sintered just fine. The bail did blister a little bit: not enough to ruin it, but enough that any metal artist “in the know” should be able to spot what happened. But I still think it’s interesting. There was one small blister on the sintered bronze section. My first thought was that I’d overfired the batch a bit, but then I realized it was exactly over the post on the embeddable bail. Silly me, I didn’t think to capture a photo of that: What I did was to immediately see if I could polish it out. Easy! I’m not done polishing this piece (it was just a spur of the moment creation, not a planned project), but I think the photo I include here (click on it for a bigger version) gives you a hint as to the blistering on the bail (in case you’re someone who uses them too), and to the way it does look like the disk itself will polish up nicely with a little more work. There’s one other item worth noting: how the bronze in the bail alloyed a bit with the copper on the other side! Look at the side shown to the right in the first photo, up near the bail, and notice the golden-colored patch. Alloying! Again, artistically, I’m OK with its looking like that. But it’s good to know it will happen. So I made a simple wire-loop bail out of phosphor bronze (melting temp listed as 1800°F), then took the other (matching) bronze washer and the Low Shrinkage Steel XT disks, and assembled it the same way as I’d done before. I fired that using the same schedule too. And, again, I noticed a bit of blistering on the bail and, with this wire-design, a bit of fusing across the loops. Again, I think that slightly grainy look is OK. Other than a quick clean-up, I have not yet stopped to polish this one at all. But I decided to post about it quickly because, this time, the main piece shrank much further away from the bail. 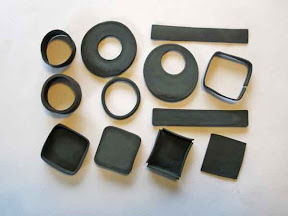 In its clay state, the loops were pressed lightly down into the piece, but the post-firing separation is visible in the photo. No alloying with the steel though, which is also good to know. But you have to see the two together to catch what surprised me the most: the difference in shrinkage! They started out exactly the same size, and look how different they are now. The current (as I write this) Hadar’s Cheat Sheet (.pdf) says that, on their own, Champagne Bronze shrinks about 30%, Low Shrinkage Steel XT about 28%, and Friendly Copper about 25%. Combos will be limited, to some extent, by the least-shinkage clay in the mix. But there’s only a 3% difference between LSStXT and FrCu, and it sure looks to me like there’s more than a 3% difference in the results here. What I can feel, but can’t really show here, is that there is maybe a 3% difference in height but it’s in the wrong direction. The one made from copper is a teensy bit thinner (i.e., more shrinkage, not less). I really do like the results I’m getting with these clays, and the 3-hour firing time is a huge help compared to some of the others. But, with the others (and any of the “older” clays, both precious and non-precious), I think I have a pretty good feel for the shrinkage. With this new One Fire Trio, I’m still exploring…. What are you finding with them? Do leave a comment! 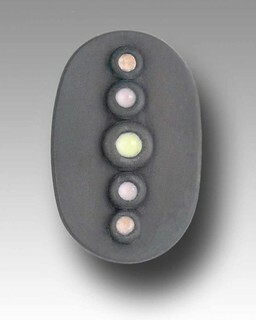 Here’s a photo showing a few more little bits from my first trial firing of Hadar’s One-Fire Trio. Though I didn’t start out by making them as perfectly-similar as would be required for a scientific comparison, I did roll and cut them to the same size. So, in order, from the most shrinkage to the least are: Champagne Bronze (C), Low Shrinkage Steel XT (L), and Friendly Copper (F). I’ll have to see if the apparent ratios continue to hold with other cubes. (That is, some differences could just be due to my having mixed more or less water into the different products. And I just stamped the letters in by hand, which could have changed the shapes a bit too.) But, with the other pieces I fired at the same time, the ratios do seem to vary depending on the shape of the piece being fired. I don’t have enough data yet to be sure, and these cubes are the only items where I made three matching pieces to start with. Still, I figured I’d share the preliminary results. Please add a comment if you try these clays and find results that are either similar or different! It’s taken me a while to post again as the state of mini-crises has continued, but I won’t bore you with those details. Instead, I’m delighted to report an exciting new development: At the start of the year, Hadar announced a new One Fire Trio that includes two new metal clay powders that, along with one of her older ones, can be de-bindered and sintered in just one firing (rather than the two separate ones that many others require). Their total firing time is just under 3 hours. Wow! Compared to the usual 8 hours (if you fuss in between) or 12 (if you don’t fuss but do sacrifice more carbon), that’s a huge difference! The older member of the trio is Low Shrinkage Steel XT. On its own, it could be fired in a single kiln-run, but that limited the combinations in which it could be used. Also, it’s a high-fire clay, so it could only be used in small amounts with some of her other clays, the ones fired at lower temperatures. But, with the introduction of two new clays—Champagne Bronze and Friendly Copper, both of which also use high-fire and single-phase processes—it is now possible to produce more combinations. Each of Hadar’s metal clay powders have their own advantages and disadvantages compared to the others. No one product (or small set of products) from her or (or any other producer) is yet able to achieve everything an artist might want. But each new combination offers new opportunities, which is what makes them so exciting! I am sure that some people got these clays and proceeded to develop complex creations. But me, I prefer to get to know the clays in simpler ways first, to discover their advantages and limitations. I have a few more-complex pieces in the works, and I’ll get around to completing their construction and firing them eventually. This post will show a few of the simpler pieces I tried first. 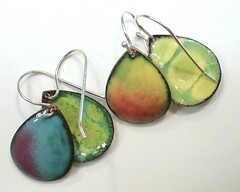 The earring pair to the left was made with Friendly Copper. The pair to the right used Low Shrinkage Steel XT in back, with the embellishment in Champagne Bronze. After firing, the copper and bronze were very lightly polished (just a quick pass with one set of (3M yellow) radial bristle disks); the steel is as it came out of the kiln; the earwires are anodized niobium (that I just happened to have handy). If / when I can find the time, I may fiddle with finishing them a bit more but, for now, I just could not resist offering this quick sneak peek! One note on firing: Hadar says that firing any of the clays in this trio takes her 2:45 (2 hours and 45 minutes). For these, I used a brick kiln, outdoors on a covered patio, when the air temperature was around 25°F (-4°C). I also know that this particular kiln tends to overshoot the goal temperature early on in the firing process, regardless of the temperature of the air surrounding it, though it holds the temperature fine once it’s had the chance to swing up and down a few times. My work-around for that is to set a two-step program, where I first get it near the goal temperature and tell it to hold there for a couple of minutes (allowing it to spike higher there), then ramp it slowly to the real goal where it can hold for the required firing time. With those two differences between my set-up and hers, firing these pieces still took only 2:58. As I said above, that’s a real treat! Another note on my kiln: I don’t leave it outside all the time. I keep it inside and just haul it out when I need to fire it. (If I fire it indoors in winter, when I don’t have any good way to vent it and I’m using carbon to provide an oxygen-reduced atmosphere inside the kiln, my CO detectors signal a problem!) Hauling it in and out takes only a few minutes each way, so it’s not a major problem, even when the temperatures are in the 20s. But, they’re currently hovering around 0°F, and that puts enough of a strain on my furnace, me, and more. I’m not leaving doors open to move kiln, kiln “furniture,” the stand, various tools, power strip, gloves, safety glasses, and more both out and then back in again. In other words, even though I have more pieces underway, it may be a while before I get around to firing them and posting the results. It’s just winter … and I don’t mind at all living at winter’s pace … for a while. 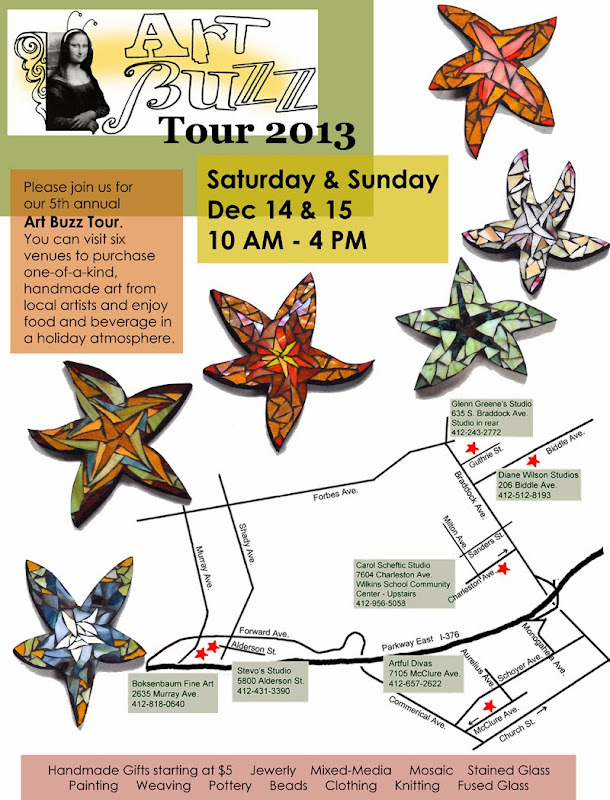 2013 Art Buzz Tour — This Weekend! Have you heard the buzz? Six sites! All in the Pittsburgh area’s “East End” this weekend: Regent Square, Swissvale, and Squirrel Hill. And my studio is one of the locations on it again this year. 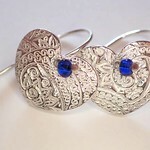 I’ve got lots of jewelry on offer, plus a handful of other small adornments. I also have aloe vera plants that need a new home, babies that i repotted from some of the big ones I keep around. (I do work with hot metals here!) BONUS: small ones are free with a purchase of $35 or more (or a discount can be applied to the price of any of the larger ones if that’s what you prefer). How long did it take you to learn how to do this? So far, I have not made many pieces out of steel. 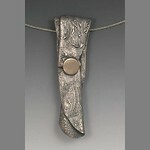 I have used bit of steel as small accents, but only a few times as the main element in my work. But, over the last few weeks, a number of us who work with and teach about Hadar’s Clays have been doing some explorations with the “Low Shrinkage Steel XT” product. Shown is a photo of a dozen pieces, which are about half of the ones I made during this exercise. While most of them turned out pretty much as I would have expected, there were a few surprises that I’m still trying to understand. I will likely have to make a few more pieces like the surprise-ones (when I find some more time to just explore), to see if the pattern repeats or if the surprises were nothing more than the occasional surprise. Specifically, we’ve been looking at shrinkage. 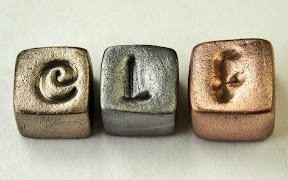 All metal clays shrink from when you first shape a piece in that medium to when it ends up as fully-sintered metal. Different products shrink different amounts. Some shrink more as they dry (go from wet clay to what we call greenware); others shrink more as they are fired (as the binder burns out and the atoms sinter (arrange themselves into a regular metal structure)). Even working with just one product, different pieces will shrink different amounts in different directions. This leads to some interesting results, such as the fact that rings (usually) shrink smaller (though how much depends on the size and shape of the ring), the clay around cracks (usually) shrinks away from the opening (thus making it look larger after it’s been fired), and holes (usually) remain about the same size (depending on how big and what shape they are in relation to the clay around them). With my background in mathematics and statistics, I tend to think of shrinkage as a “degrees of freedom” issue: if a clay wants to shrink a certain percentage and, for some reason, it can’t shrink that much in one direction, it compensates by shrinking more in the direction where it has more freedom to shrink. Except, it’s nowhere near as exact as that might make it sound…. It may vary from one time to the next. It may also vary from one artist to the next. But I write all this simply because I wanted to take a moment to say how much I enjoy exploring this entire “powder metallurgy” process: trying slight variations that go increasingly farther away from an original starting point just to see what happens. That is, in relation to the question in the title of this post (which I’ve been asked more times than I care to count) my answer is this: I hope to continue to learn as long as possible. I want to keep adding more information to my store of knowledge but, at the same time, I hope I’m never done learning! 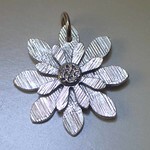 The firing of fine silver metal clays is easy! Design, construction, and finishing are each more complex than the firing itself. Yes, firing does involve some details but, once you’ve sorted out placement, position, temperature, and time, you may just turn on the kiln and go do something else while the binder burns out, the metal particles sinter, and the load finishes. 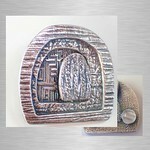 Metal clay artists working with other metals, however, know that the firing process for those is much more complex. The difference is that precious metals don’t react with oxygen when they’re heated, but non-precious metals do react. 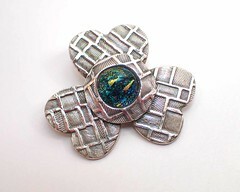 This may cause undesirable color changes (such as firescale from the copper in sterling silver). Even worse, though, these reactions can change and damage the actual structure of the solid metal even if you’re working it at temperatures lower than where they’d melt. (This is not specific to metal clay: you can destroy other metal forms the same way.) Could you just restrict the amount of oxygen during the sintering process? Not exactly! Because the “clay” in metal clay involves binders, you first have to burn off all the binder before the metal particles can sinter. And, to burn off the binder, you need oxygen. In short: at first, you do need oxygen and then, later on, you don’t want to have it. So each “base metal” clay product provides its own instructions for firing. These offer their approach for how to (a) allow enough oxygen to burn off the binder, while (b) still allowing the metal to sinter successfully. If you understand that as the goal, and like to play around, you can try various ways to make it happen regardless of what any particular manufacturer recommends. For many years, in the instruction manual provided on her blog, Hadar Jacobson recommended a two-phase firing schedule for her clays (which also required a cooling phase in between). It took a long time to complete a full firing cycle (basically an entire work day), but it worked. The length of the firing process did somewhat limit the number of production runs a metal clay artist could complete, depending on how many kilns you had available, but it was even more limiting in relation to most class and workshop settings. At some point in the last year or so, Hadar started talking about a different approach. This one used something she called pre-firing (a relatively short (half-hour-ish) firing on top of carbon to burn off the binder) followed by one full-scale firing (where you then cover the pieces with carbon and fire for a couple hours to sinter the metal). Best of all, there was no need to wait between the two! Once pre-firing was done, you could proceed straight to the final firing. That pretty much cuts in half the time required to fire a complete load. Regardless of which device you chose to use, you would then cover the pieces with carbon and follow up with a firing that was pretty much the same as her old phase-2 process. I tried it both ways and, suddenly, I began having all sorts of problems. Yes, they were ones I had seen before, but then only rarely, and they had provided enough clues for me to quickly diagnose any problems and fix them. Now, however, I was not finding ways to fix things. And, hey, the old method might have been long, but it worked for me. So I kept on using it. But with the latest version of her Instruction Manual, Hadar has stopped even mentioning the old way. And pretty much everyone in the group of teachers going for accreditation in her program seemed to have shifted over. So, sigh, I’ve spent the last few weeks simply trying to figure out open-air pre-firing for myself. I have not yet mastered the in-kiln method, but it seems I’m not the only one having some trouble with that one. The problem there is that, sometimes, part of the binder on the “down” side of pieces does not burn out, so the metal then cannot sinter. This may stem from the fact that, with no heat coming up from the bottom, the carbon is insulating that area too well. Heat will reach that side of each piece, eventually, once the carbon itself gets hot enough, but that may risk leaving top-sides exposed to oxygen for too long. Another approach, trying to solve that by turning the pieces over during the pre-firing, means handling very hot pieces in their most fragile state, de-bindered but un-sintered. No, thank you! Some people seem satisfied to solve this dilemma by simply firing their pieces twice, once with each side up; but if it takes that much to get them to sinter I figure I might as well just stick with the older method. But I think I am finally getting the hang of the stove-top method!!! The problems I’d been having were that my pieces were curling and/or cracking, which I knew meant they were getting too hot too fast. Hadar kept talking about turning the heat down if you saw the pieces on fire, but I never saw any flames. She talked about turning the heat down once you saw binder-smoke starting to appear, and I was taking a lot of care to do that immediately. She and the other instructors talked about how long their pre-firings took, and mine were well within those limits. After multiple attempts, I finally figured out that I really did have to heat the pieces on a very, very low flame. Maybe it’s just my stove, but I’m down to a mere fraction of the flame I’d use simply to boil water. Curiously, doing it this way does not seem to take much longer over-all than what I’d been doing before: it takes a bit longer before I see any binder burning off, but the pieces blacken completely rather quickly. Another problem I’d had was that sometimes one or even a few pieces would not seem to burn off their binder. But I’m getting better at moving the container around over the flame, when that does happens, which seems to solve that. I am still having the occasional failure (i.e., a bit more often than the old way), but I’m clearly making progress here. All seven butterflies in my last mid-fire load, for example, turned out fine. But, there’s something else to consider. In addition to the time that is “lost” to the occasional failure, one also has to actively watch the entire pre-firing process. You can’t do anything else useful. Well, maybe you can; but I sure can’t. It happens too quickly to catch a brief nap (yeah, I’ve been known on occasion to sleep through an entire silver-load); and it takes too much attention to spend time doing fine-finishing on pieces from the last load (which is what I usually try to do during firings). With silver pieces, I never really counted any “firing” time into their cost because I could accomplish other things while that was happening; with these pieces, however, now I do have to factor that into the price I charge for them. (I’d have that same dilemma with the in-kiln pre-fire method.) So I’m still trying to figure out how I feel about all this, but at least I have that feeling of accomplishment over approaching mastery of what currently seems to be the most popular method for pre-firing Hadar’s clays. By the way, even though I really am kind of swamped with to-dos, I finally figured out a way to add captions to photos that would work with this blog! It was easy, once I spent a bit of time on the task. 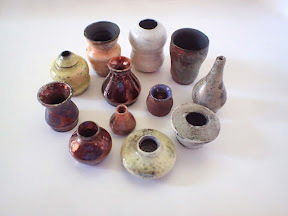 I mention it, however, because there are some other metal clay hints buried in those notes; I’m really hoping to find time to write more about other aspects of firing in the coming weeks…. Oh, and all the pollinator-pieces used as illustrations here will be available at the Western PA Garden Marketplace on April 20. It’s not an art-event: the emphasis is on gardens and landscaping. My being there is just a little “bonus” treat, on top of all the plants and garden supplies. But if you’re reading this from the western PA area, it’d be great if you were to stop by and say “Hello!” on Saturday. Well, I still don’t seem to have my head above water, schedule-wise, but there is a bit of news I’ve been sitting on for over a week now, and I just have to say something about that! I have mentioned Hadar Jacobson in this blog before. I’ve found myself inspired by much of her metal clay art. I really enjoyed participating in a workshop she taught here just about two years ago (which I reported about in a series of six posts that started here). I find her clays to be delightful to work with. And I’ve been honored to have three of the pieces I’ve made using those clays selected as illustrations in two of her books. She has invited me to be in the “charter group” of teachers to participate in this! Now, we are just at the beginning of a year-long process. On the one hand, I am thrilled that there will be a cadre of us (all around the world!) spending pretty much a whole year working on a series of common projects, talking about the results, comparing notes, seeing what is and is not reproducible and what really does vary by individual, how to handle all this in various situations both in-class and on-line, and more, all culminating in a series of get-together workshops next year. On the other hand, I am also a bit intimidated to think that this will take a whole year of regular tasks and assignments just to get through the process, so I’m betting that some folks will drop out along the way. At the moment, I am simply hoping that I can hold on (although, of course, another part of me really does want to make it through “with flying colors”…). But one of the things that really helps to maintain my fascination with the whole metal clay / powder metallurgy process is how intrigued I am by the continual learning that I am privileged to gain with it, and the opportunities I then have to share all that with others through classes, workshops, demonstrations, publications, and more. So that is the spirit in which I accepted the invitation. We’ll just have to see how it goes! Have you heard the buzz? It’s even louder this year! Over forty artists! Seven sites! All in the Pittsburgh area’s “East End” this weekend. And my studio is one of the locations on it again this year. At WSCC (where I’ll be), the Holiday Gift Shop will still be running downstairs, and I am pretty sure that Daviea Davis will have her glass mosaic studio open too, upstairs across the hall from mine. If you’re in the area, I sure hope you can stop by. To say, “Hello” and “Happy Holidays” at least. If, for some reason, you can’t get yourself there in person, how about leaving a holiday greeting as a “comment” on this blog post. Even having you say just “Hello” or “Happy Holidays” would be much appreciated! I look forward to seeing / hearing from you, dear readers, so I can extend my best wishes for this holiday season to you too, in return, in a more personal way. 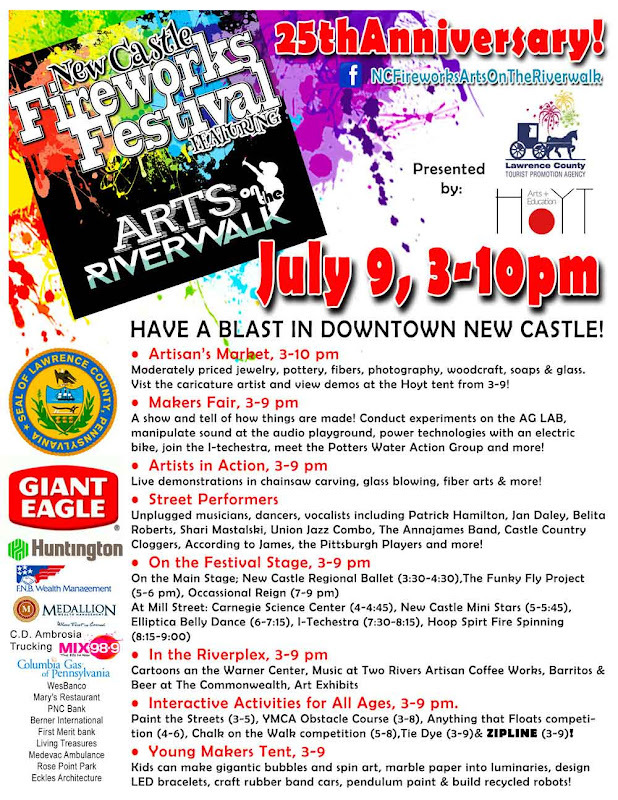 After ten days, and increasing heat, this year’s Three Rivers Arts Festival has come to a close. And a very hot ending it was. Hot for Pittsburgh. And, officially, it’s still merely Spring. What will summer bring? Time will tell…. The trees as well as the breezes wafting up from the Point over the fountain are what made the location bearable on the hottest days. (It was well over 90°F the last weekend; though I did not note the humidity, that was high too.) The photo of the fountain, below, was taken from the same spot as the first shot, though I’d just turned a bit to my right. That location is a bit of a challenge on the windiest-stormiest days but, over the years, Koolkat’s owner Kate and the rest of the crew have figured out increasingly better ways to manage that. But during the hottest times down there this year, and especially the final weekend of the festival, I kept remembering my mother, standing in the kitchen of our house in South Florida–with the big double patio doors slipped into their wall “pockets” so the whole room was open to any breeze that might come from the ocean and up the canal behind our house–and saying, “The heat won’t get to you as long as there’s a good breeze.” As a child (especially as a teen, and one who was happiest at temperatures she considered cold) I would argue, “I will not agree to anything beyond that the heat won’t get to you as quickly as long as there’s a really good breeze.” I know she’d’ve liked the weather at this year’s festival, and the breezes in Gateway Plaza, and I wish she could see the art jewelry I only really got into making, and even selling! !, after she was gone. Well, by the time I’ve managed to get around to posting this, I’m really talking about the week before last, but I figured I’d keep the same basic post-title I’d started this series with, and just keep going. After writing last week about making some textured domed disks, so that I could use them in a bracelet inspired by Maria Richmond, now I’ll talk about how I’d imagined completing the project with an idea inspired by a post by Hadar Jacobson about making magnetic clasps from steel metal clay. I thought I’d do pretty much just what Hadar suggested. The only difference was that I used a textured layer of her rose bronze clay, rather than the smoother layers of yellow bronze and copper she showed in her instructions. I draped that over a dried layer of her pearl gray steel. After letting it all dry, inserting a bronze wire bail, and “refining” everything, I fired it as recommended. The rose bronze cracked. The steel under-side (not shown) seems fine. I tried again, this time using textured copper draped over pearl gray steel. Again, the steel under-side (not shown) came out fine but, also again, the copper over the top cracked. I patched and otherwise repaired all three pieces, and refired them. You can see that much of the wonderful kiln-induced coloring disappeared. (Compare that photo to the first two above; the colors were also mentioned in part 1….) No crisis there. One copper piece (top, above) shows only a tiny bit of cracking, at its edge. That’s not ideal but, at this point, I’m likely to leave that alone because, sigh, the other two came out worse than before! What happened? My guess (and this is only a guess), is that the steel (which sure had seemed to be sintered) had sintered some more (that is, it became denser and thus shrank some more) and the movement associated with that further shrinkage in the steel is what led to the additional cracking in the copper or bronze layer. If I’d known that was coming, I could have measured everything much more carefully at each step along the way, and used that as a way to test my hypothesis (i.e., the guess, above). But I didn’t know; I just didn’t think to stop and take the time to measure…. OK, much better! Much less cracking with that mix! Again, sanding the steel on the other side shows that it appears to be sintered. I’m not about to test that by refiring either of these. I’ll just live with a few hairline-crack issues on these pieces; all that means is that I’ll have to think especially carefully about how I use them. Sometimes, even when I don’t think to do pre- and post-fire measurements, I do still come up with “Plan B” ideas. So, while I was at it, I made a couple toggle clasps using Hadar’s regular (i.e., yellow) bronze powder, to put in the box when I was (re-)firing the other clasp elements. Again, they were made in two different sizes. Their textures, curvature, and size match the domes I made to use with the coils; I added a heavy-gauge bronze wire loop to the toggle bars. In this photo (and the last one above), I show them after firing and after I’d brushed them just enough to confirm that they’ve sintered. I’ll shine them up a bit more before I go to use them in a piece. Though none of the pieces from my last firing show the lovely kiln-coloring I got with the earlier batches, I do believe that there will be enough acceptable elements in all this that I can finish off my first round of bracelets with a few components left over. Earrings, perhaps? Or the start of a necklace? The lifespan of a no-flake-foil firing box…. I folded this little firing box out of No-Flake Foil (from Cool Tools) some time last April, although I didn’t record the exact date because, at the time, I had no clue it was ever going to be worth noting. I first wrote about this particular box in a post last July, after I’d noticed a little flurry of discussion about what people used to fire the copper, bronze, steel, or other metal clays that needed to be buried in carbon. At that time, I said it had held up just fine through several dozen firings. I do tend to fire pieces in spurts (some weeks, nothing; other weeks, multiple loads) but, since then (especially, prior to the last “Holiday Season”! ), it has survived dozens more. The last time I emptied it out, however, during this past weekend and after it had provided almost ten months of regular service, I was sad to note that it has begun to sprout a few little holes. They are tiny and not easy to see (so of course I highlighted them with big red arrows for you in the photo!). But I know they signal the beginning of the end for this particular box. So I thought I should note the date that it has been retired from duty as my primary firing box. My number-two box will step into that role. The experimenter in me isn’t quite ready to part with number-one yet, of course, so I’ve got it stashed away at the moment. I may try using it again a few more times, just so I can document its demise for my own information. But, really, it’s just foil. There may be nothing more worth noting about it, except that I am amazed, and delighted, that it has already done so well for this long.